Is your kid excellent in a certain skill set and you want to motivate him/her with most wonderful way? Here is the beautiful way MIT Gurukul along with our creative team has done it for Miss Sera Mukherjee! When Rama Ma’am (Principal at MIT Gurukul) introduced us to this PYP’s 5th grader, IB school student, we saw a shy, nervous girl at first. But once we got to know her more, we realised this girl has an extraordinary talent. Sera is a special child with an amazing artistic mind, has a vivid imagination and great language skills. We were amazed to know that she has written almost 11 unique stories, with illustrations. She has each character well defined, she has each scene choreographed with camera angles too. The IB school curriculum develops each child with numerous qualities which are far different than normal schools’ curriculum. In IB school they do not teach children by keeping morals in front of them. They teach different concepts & help students decide the moral on their own. We experienced all of this while taking a walk through the beautiful & humongous campus of the MIT Gurukul. This project was no ordinary goal to achieve. We had to design a creative storybook preserving Sera’s way of defining characters, matching her expectations & launch it in one month’s time as her PYP graduation day was on the edge. Before we could get to work on the storybook, we wanted to get a closer look at Sera’s world. Being an artist, our emotional attachment with Sera begin when we dove through her stories. Our gift, big brand new sketchbook along with a bundle of crayons made her felt comfortable with us. When asked where does she sees her book going, she answered ‘I know where it’s not going, that’s mountains and rivers!’ She wants to see her storybook in Crossword. 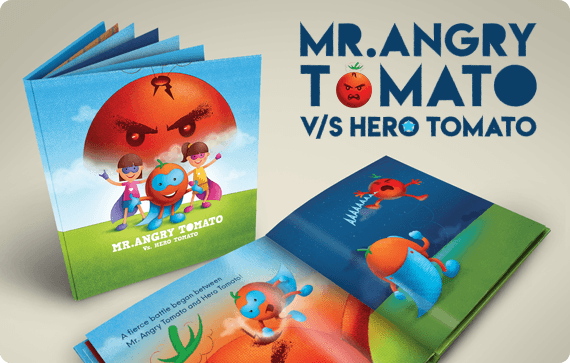 Among all the stories she was eager to see published ‘The Angry Tomato’. Dimpal Ma’am & Prasuna Ma’am gave us fruitful insight about the concepts taught in IB school. The original story had a few missing links. There were concepts but not highlighted. We bridged the gaps by highlighting those concepts like misunderstanding, responsibility, being panicked, being angry etc. At every stage of the storybook making, Sera was asked for her review of the work done. Through empathy round, we got complete idea about the requirements. We redrew each scene with few alterations. We presented Sera, the story we polished by mending the holes and gaps in the original one. 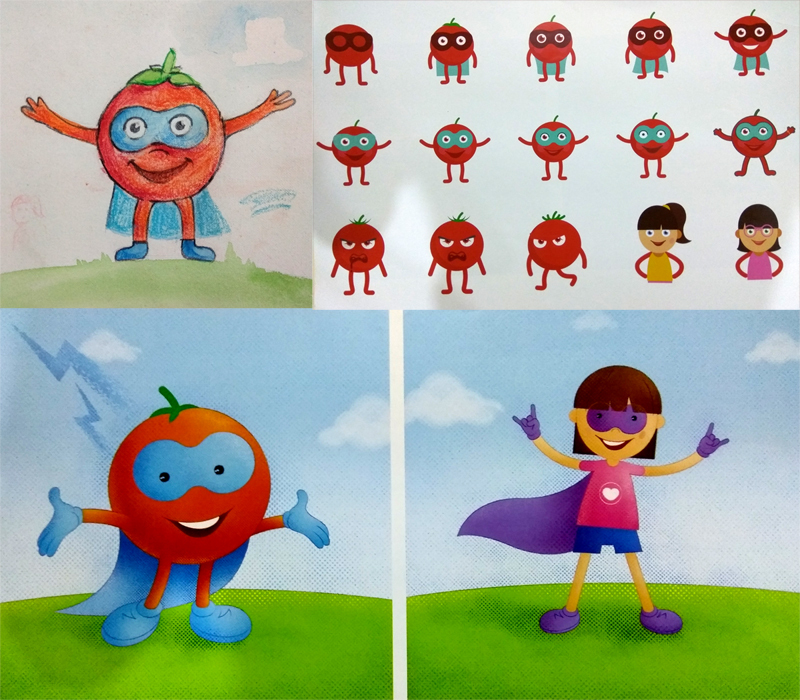 The format of the book was going to be ‘More Illustrations fewer Words’ since it would help kids relate to the drawings. After 2 storyboarding drafts, we had the final layout in front of us. 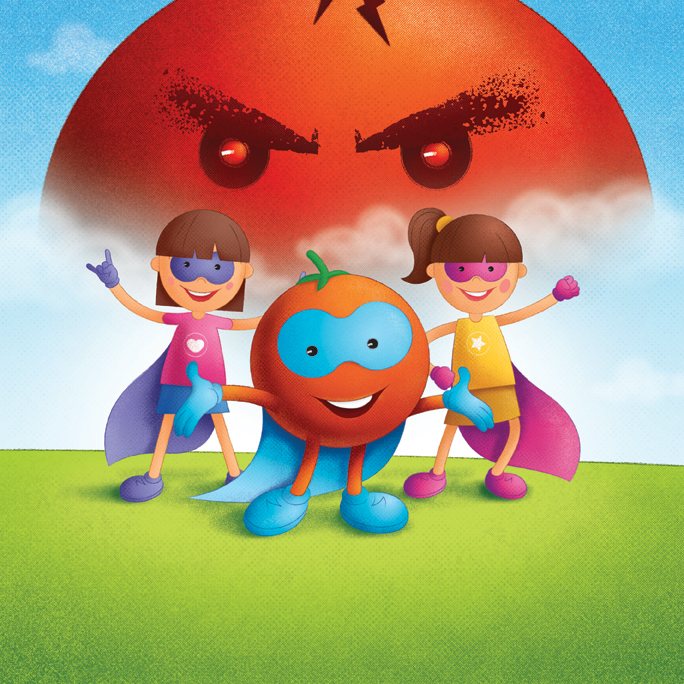 After finalizing the storyboard, we turned to giving life to characters of the story: Lisa, Elvie, Hero Tomato and Mr. Angry Tomato. Kids can relate to those characters which they can easily redraw. Considering this fact, we tried to keep the characters as simple as possible. We gave them personality based on their role in the story. We gave the hand-drawn appearance to storybook to make the experience humble. We tried different medias for the feel, like crayons, pencils, oil pastels, watercolors, poster colors… with a number of papers and textures. Along with this, there was an array of digital tools we tried out to get the desired results. Stroke by stroke, the characters started coming to life. We were passionate & excited to launch the youngest story writer of MIT Gurukul, the IB school. With amazing planning & dedication, the entire work was delivered by only 3 people! Everything was done in given timeline. Since the story is for kids and a very energetic one at that, we went for a bright color palette with red, blue, green and yellow and bold yet simple font. These colors & fonts helped a lot in defining particular emotions and the moods. There was a lot of colorfulness in the scenes to add the required drama to the story. We tried different colors, textures, strokes by printing them on various paper types with various finishes. We printed sample copy of the storybook after all the details & corrections. It was a celebration at PugMarker. When we got the final look of the book and the copies were packed in a pretty pink box to be presented to Sera, all the hard work was paid off. It was truly an enlightening experience for the whole team. We cherished every stage, every moment of the process, got to learn a lot about a lot of things. All the days and nights at PugMarker during the process has been a treasure for all of us. Especially, our attachment with the little author, Sera made the project so dear to our hearts. Sera wrote ‘Hello World’ in her book’s acknowledgment. She already sees her storybook going in every corner of the world. The book launching was on Sera’s PYP 5th grade Graduation Day. 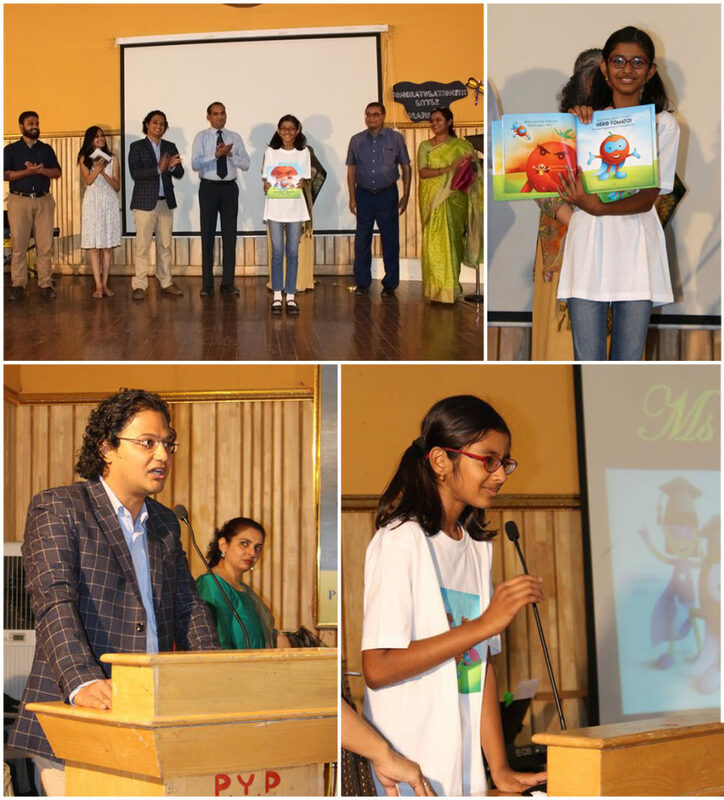 We were excited to see the surprise and joy on Sera’s face when her book was unveiled in the room full of teachers, her friends, classmates and their parents, and Sera’s father, Mr. Soumitra Mukherjee as well. She was out of words when she described how happy she was and how much she wanted her father and her friends to see the book. We felt really worthwhile when we watched as Sera gave her first Autograph on her storybook, as a 9-year-old published author.